HRBSE-103 | Size: 200 ml / 6.8 fl. oz. Provides all-day moisture and protection. Safe using during pregnancy, prevents stretch marks. Restores tissues affected by stretch marks, cellulite, loss of elasticity and firmness. Protects against skin disorders that may appear due to the skin's stretching and breaking off its composing fibers as well as clusters of adipose tissue. Moisturizes and nourishes, while revealing an elastic, firm, supple and healthy skin. The skin becomes firmer, smother with an improved texture. For optimal results, follow a few weeks regimen. 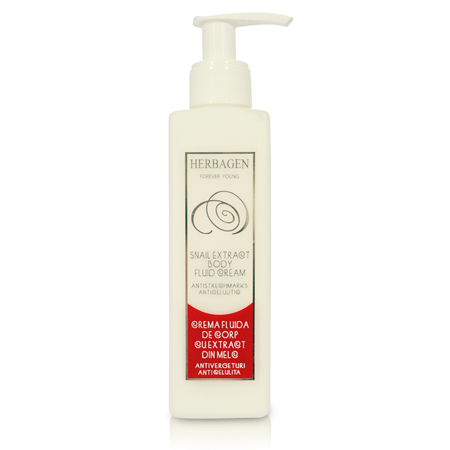 Herbagen Snail Extract Line contains Poly-Helixan - a powerful active natural and ecologic ingredient with miraculous regenerative properties for the skin, obtained from the garden snail (Helix Aspersa) originating in Chile. Using this secretion the snail is able to regenerate its shell or skin which is constantly damaged due to its movement on the ground, or other aggressive factors. Poly-Helixan's composition is high in restorative, complex ingredients: alantoin, proteins, vitamins A, C, E alphahidraxyadicds, mucopolysaccharides,proteolytic enzymes, collagen and elastin. Different studies showed Poly-Helixan has miraculous power in reducing skin’s imperfections occurring in: old acne scars; keloid after surgery, radiotherapy, dermabrasion, laser treatments or chemical burns; skin burns; skin spots, due to aging or sun exposure; deepest wrinkles. Use the product 1 or 2 times per day, after shower, on the problematic areas (thighs, hips, abdomen, cleavage).Apply the cream with circular movements until it is completely absorbed. The skin becomes firmer, smother with an improved texture. For optimal results, follow a few weeks regimen. INGREDIENTS: AQUA, HELIX ASPERSA SECRETION/POLYHELIXAN, GLYCERIN, GLYCERYL STEARATE, CETEARETH 20, CETEARETH 12, CETEARYL ALCOHOL, CETYL PALMITATE, OLIVE OIL (OLEA EUROPAEA FRUIT OIL), BUTYROSPERMUM PARKII (SHEA BUTTER), CETYL ALCOHOL, ARGANIA SPINOSA KERNEL OIL (ARGAN OIL), SODIUM BENZOATE, POTASSIUM SORBATE, PARFUM, BENZYL ALCOHOL, BUTYLPHENYL METHYLPROPIONAL, GERANIOL, LIMONENE, PHENOXYETHANOL, ETHYLHEXYLGLYCERIN, ALLANTOIN, TOCOPHEROL, EDTA, 2AMINO-2METHYL-1PROPANOL. Poly-Helixan: a powerful active, natural and ecologic ingredient , obtained from the garden snail secretion. Glycolic acid: and has a peeling effect on skin. Collagen and Elastin: restore the main fibers and renew the skin. Proteins: contributes to a better nutrition and softness the skin. Vitamins A, C, and E: with antioxidant and anti-inflammatory effect. Proteolytic Enzymes: boosts cells renewal. Shea butter, Argan oil (bio), Olive oil: to nourish and increase the skin elasticity and firmness.